Well I was going to talk about strollers this week and mention how we went with a Maclaren Easy Traveller because we heard from so many parents that this simple, lightweight system is much more convenient than regular all in one strollers. But then the recall went out. While I'm sure the fix will be fine I am going to hold off until I get the hinge guards and reevaluate then. So here's something more fun anyway...Staci found it on Etsy. It's a custom made fox toy made by Annie who goes by Bird and Little Bird. The fox is made of all natural materials and filled with organic cotton.She also offers a custom bunny and patterns for both. 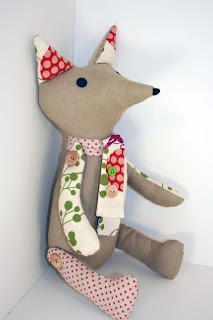 While Annie does offer some ready made foxes what's cool about her stuff is that she works with you to customize it to go with your nursery or whatever you want. The body is linen but she will send you pictures of swatches to be used for the ears, arms, legs and scarf. There are buttons on the arms and legs so maybe it should go on a shelf until you're child is old enough to be around that stuff. It takes about a week from when you decide on the fabric to when it's shipped. Last week we received the one we bought and we love it. I'd show pics but you'll have to wait until I show more pics of the room. I'm really behind in taking photos. You can also check out her blog here.